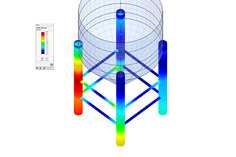 In STEEL, you can select the stress Sigma Delta for stress analysis. What is it used for? If you select Sigma Delta, the maximum difference is determined between the normal stresses. The program shows the actual difference between the stresses of the individual load cases. In the results tables, only one existing stress value is shown but no corresponding load cases or utilization ratios. If there are, for example, only members subjected to pure tension, then the difference of the smallest and greatest stress is shown as absolute value. In this way, the difference of different load cases can be considered. The output of sigma delta can be used for a fatigue design.